When I started getting larger, more visible tattoos, several people asked me, “What about your wedding?” — before I’d even met my now-husband. I always looked at them as if they’d asked, “What about potato salad?” I was unclear on what the two topics had to do with each other. In many cultures around the world, temporary henna tattoos are a long-standing bridal tradition. But even as permanent tattoos become increasingly common and accepted, there’s still a pervasive idea in Western culture that to be a beautiful bride, a woman must be unmarked. And as with any backward and oppressive idea about how women should behave, there are hordes of us who delight in flouting the supposed contradiction between tattoos and a fairy-tale bridal glow. The hashtag #tattooedbride appears nearly 21,000 times on Instagram, and there are pages and pages of beautiful, inked-up brides on Pinterest. When I was planning my wedding in 2015, trying to hide my tattoos never crossed my mind. In fact, I had the back of my dress lowered two inches so it would better frame my back piece. And I took it a step further, getting one tattoo touched up and another covered up with a new design in preparation for the big day — a trip to the tattoo parlour on the same list as a teeth whitening and a haircut. My tattoos are important to me in my everyday life, so it only made sense that they’d be important on this big day in which everything seemed to have added significance. The giant red rose on my back is a memorial tattoo for my cousin, Sabina Rose, who died when she was 20 and I was 21. If she’d been alive, there’s no question she would have been my maid of honour, and she was on my mind a lot as the wedding approached. She wasn’t there to make lists and scroll through Etsy with me, and she wouldn’t be there when my best friends and I went to get our hair styled and our nails done together. But she would be there, inked into my skin, and making the red of that rose’s petals as bright as possible felt like a small way to involve her in the flurry of wedding preparation. 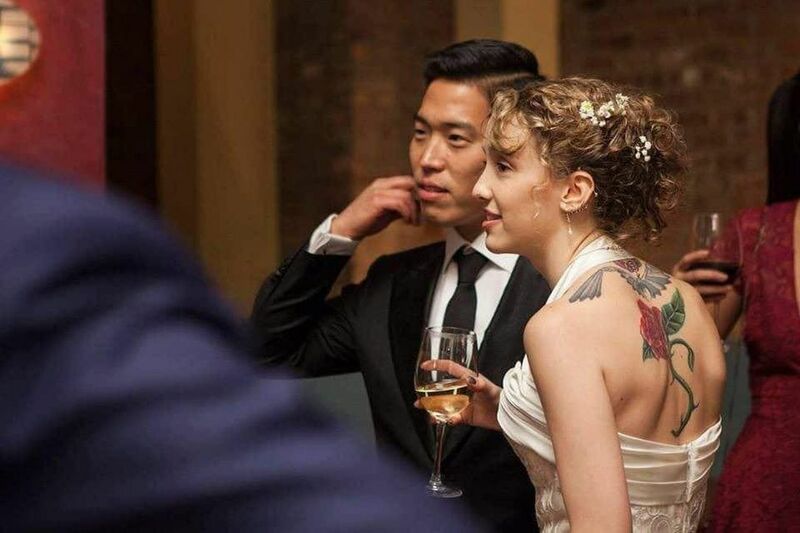 Katie Wudel, a digital media editor based in Los Angeles, got her tattoo of a peacock feather touched up before her wedding for similar reasons. The tattoo has several meanings for Wudel, as they so often do, but a main one is the remembrance of her mother, whom she lost at a young age. “It was a way of bringing my mother into the festivities,” she says. She also had practical reasons for her touch-up, since her feather tattoo doesn’t include any black ink, so it tends to fade especially quickly. “I wanted every detail to be visible in photographs!” she says. In addition to brightening up the rose on my back, I also got brand new morning glories on the back of my neck, to cover up an old tattoo that I’d long planned to alter or cover. It didn’t come out quite right to begin with, and then it faded and blurred for six years, so I didn’t particularly want it immortalized in my wedding photos. Jess Zimmerman, a writer and editor based in Brooklyn, did just that. She’s getting married in May and recently covered up an abstract tattoo on her upper back with a rose. There are so many outdated and stringent ideas of what a bride is supposed to be, and so much pressure on women to change themselves to be “perfect” on their wedding day — to lose weight, fix their teeth, change their hair, plump their skin. There’s a whole industry that thrives on this pressure. Everyone wants to look good at their wedding, even the most anti-patriarchal feminists who’ve manage to escape internalizing some of the most of the toxic ideas about what “looking good” means. Involving tattoos — personal, significant parts of our appearances that go against many of the more restrictive ideas about beauty — is a way to hold onto some individuality through the mind-numbing process of wedding preparation, even if we go along with some of the traditions. It’s a way to hold onto ourselves, and resist the “bridal” mould.